The Catholic Jedi Academy: Who Knew?! Squanto Was A Baptized Catholic Native American! Who Knew?! Squanto Was A Baptized Catholic Native American! An interesting bit of trivia is that the first American Thanksgiving was actually celebrated on September 8, 1565 in St. Augustine, Florida. The Native Americans and Spanish settlers held a feast and the Holy Mass was offered. 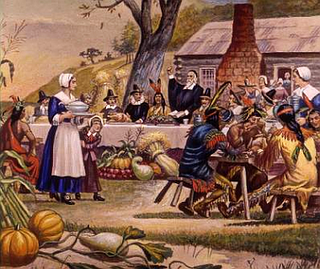 The Catholic origins of Thanksgiving don't stop there. Squanto, the beloved hero of Thanksgiving, was the Native American man who mediated between the Puritan Pilgrims and the Native Americans. Squanto had been enslaved by the English but he was freed by Spanish Franciscans. Squanto thus received baptism and became a Catholic. So it was a baptized Catholic Native American who orchestrated what became known as Thanksgiving.